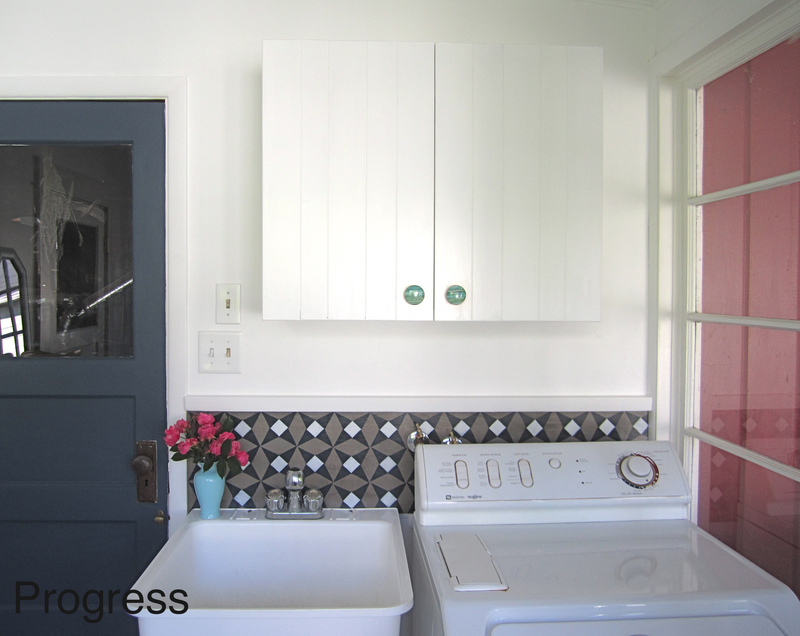 I’m excited to show you the progress we’ve made so far in the laundry room! Covering the dingy yellow walls with bright white paint ranks as one of my most satisfying home projects, even if it was among the easiest. Please keep in mind that this is a ‘progress’ post, not an ‘after’ post. There is still a lot to be done in this room, but take a look at how far it has come. 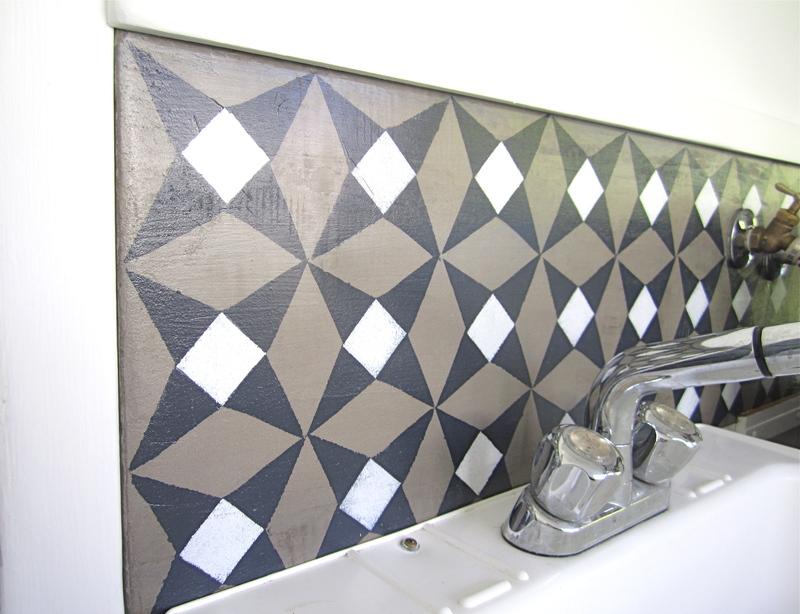 Make a backsplash for behind the washing machine (I’m fine-tuning a way to DIY something similar to the encaustic tiles. Failure or not, I’ll let you know here). Create some kind of closed storage for shoes, grocery bags, hats, mittens, etc. I decided to wait a little longer on the floors. The shade of blue in my head doesn’t exist in the VCT tile world, so I’m going to do some more research and see if I can find something comparably priced (though it’s not likely, at $0.79 a square foot) that I like. The other uncompleted item on the list – creating closed storage for shoes, bags and sundries – is actually underway (the top of it is visible in the picture below), but there’s quite a bit of work to do before it’s ready to share here. 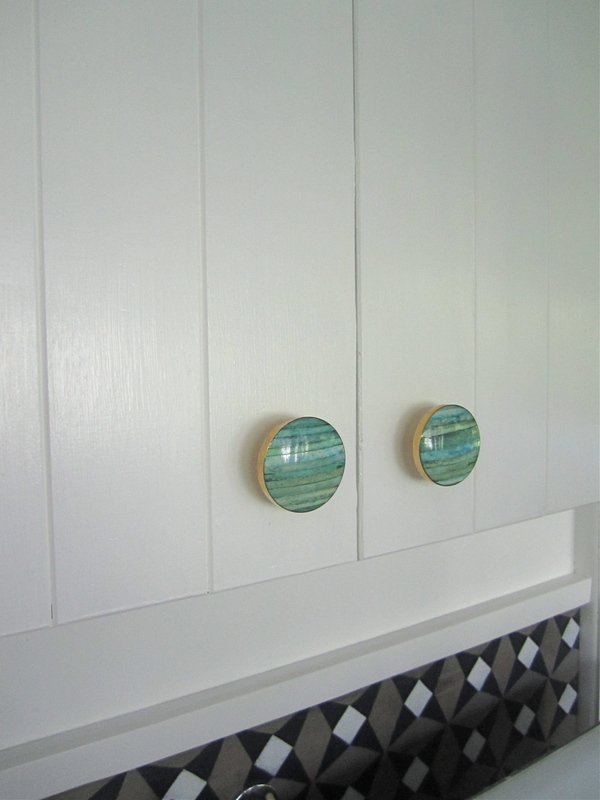 Change light switch toggles to white ones (there is a mix of beige and white ones and, even though it’s a laundry room and I don’t overall mind it a little mismatched and funky, I’d rather have them be white to blend in with the walls). It’s more fun to talk about what we did get done though! I painted the walls Pure White by Valspar and gave the door into the garage a couple coats of Newburyport Blue paint by Benjamin Moore. 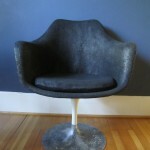 Cameron built the cupboard with materials we already had (Cameron hoards construction materials like I hoard beautiful, broken chairs) using this Ikea one as loose inspiration. The main element we liked was the slatted doors, which I – much like Mera with the bead board in her bathroom renovation – thought would give some visual interest to a wall of white. 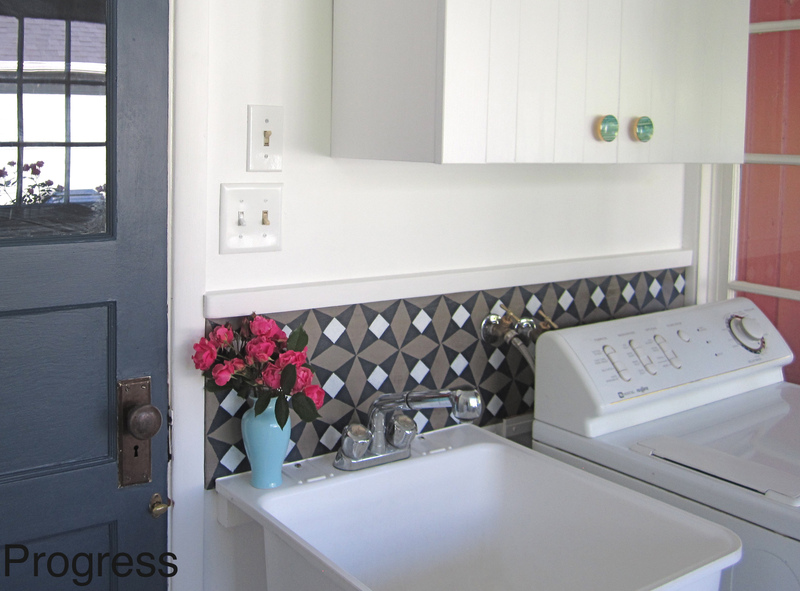 The pretty hardware is from Anthropologie, and I love the size and color of the knobs. I found the Ardex Feather Finish at our local hardware store. It came in a ten pound bag and cost $18.99. I have lots left over (if not quite a literal ton, certainly a figurative one), and my brain is teeming with ideas of other things to make. 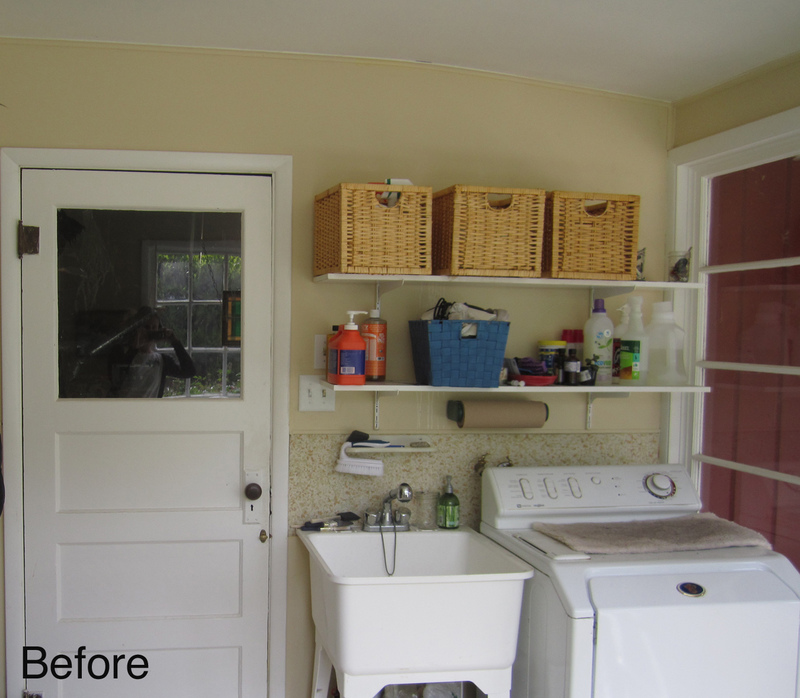 As a base for the backsplash, I used a piece of cement board – which is usually used as a tile backer – that we had already (see parenthetical note about Cameron hoarding construction materials above). 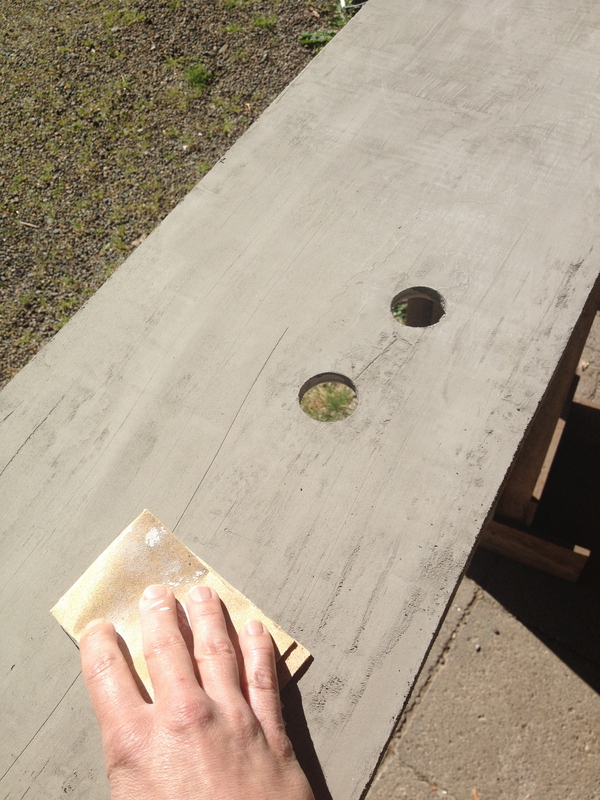 Before I applied the cement, we cut two holes in the board where the washing machine hoses would go, so we wouldn’t have to drill those out later. 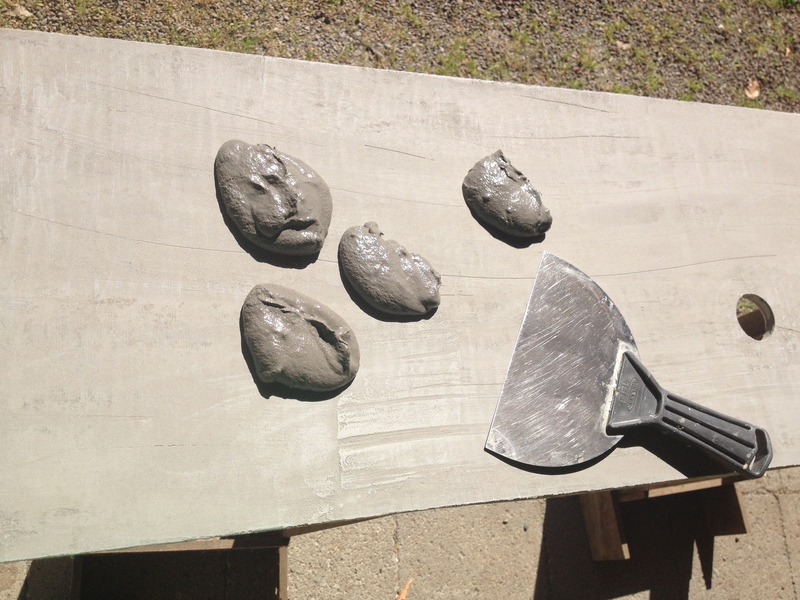 I laid it out on two saw horses – this project was made easier because I was able to work entirely on a horizontal surface and entirely outside, making clean up much easier – and mixed up the concrete following directions on the package (a roughly 2:1 ratio of water to powder). 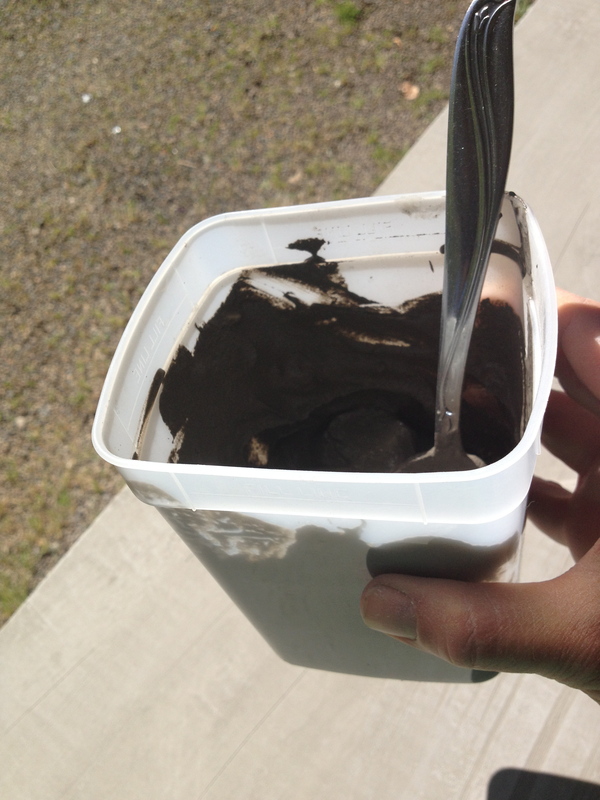 No need for buckets and trowels; I used a plastic container and spoon. 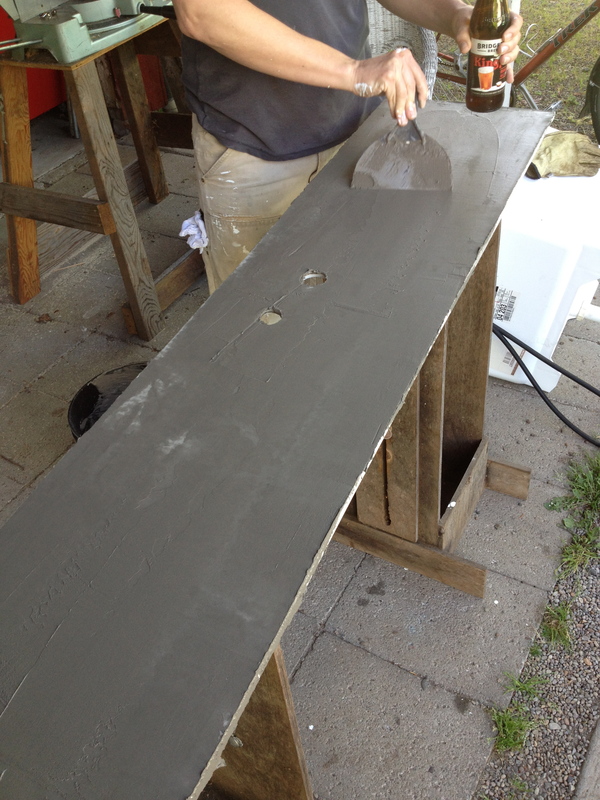 Though I was nervous at first, applying the concrete was straightforward and went very quickly. I applied a thin coat (it took less than ten minutes) then washed out my supplies and let it dry overnight. *Mera called to ask whether Cameron was wearing the Carhartts she gave me ten years ago. Folks, that is ME. Schlubby clothes, massive forearm muscles and all. The next day I sanded it down and then applied a second layer, being more careful this time to make it as smooth as possible. And that’s it! 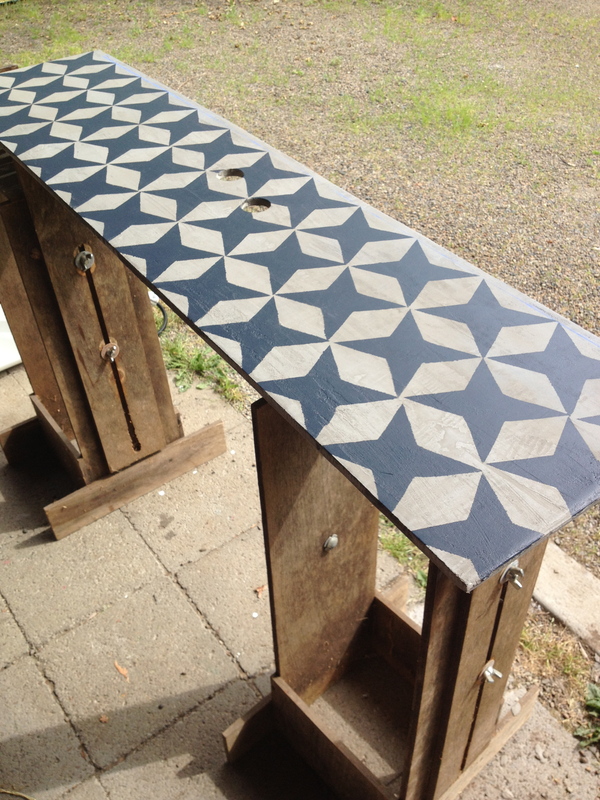 When the second coat was dry, I just sanded it smooth and wiped it off so I’d have a clean surface for stenciling. The entire process took about half an hour of work time, including clean-up, and – seriously – a monkey holding a beer could do it. 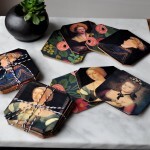 Before I made the stencil I spent some time wandering around the Internet, looking at tiles and envisioning how I could recreate them. 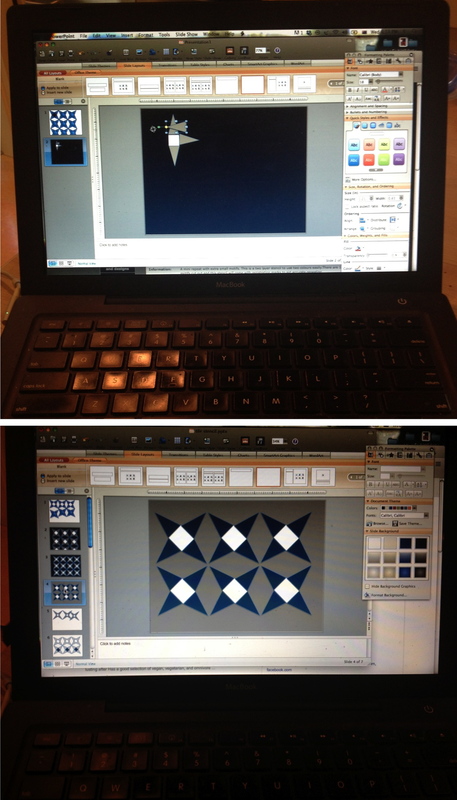 Then I drew up a pattern and tried out different colors using Powerpoint. I’m sure there are lots of programs better suited to this kind of thing, but I have spent an inordinate amount of time making Powerpoint presentations and so for me this was by far the quickest, easiest option. Because the area I was covering was relatively small, I cut just a single pattern piece, rather than rows of them like in the computer image above. 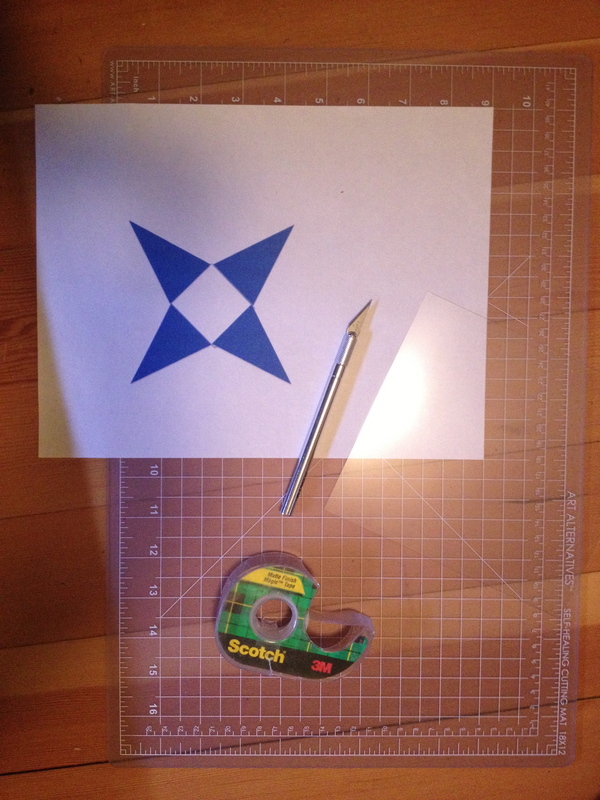 I made the stencil using a piece of a plastic sheet I got at the craft store (I don’t remember the particular name of the plastic, but if you are interested leave a note in the comments and I’ll track it down) for less than $3. It worked perfectly; it was stiff enough to make crisp lines but still pliable, strong but not brittle. 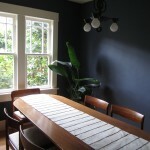 I used blue paint I already had around – Hale Navy by Benjamin Moore – and just made my way from left to right along the length of the board. At the end of each row I washed the stencil with soap and water and then blotted it with a towel before beginning the next one. When the blue had dried (it didn’t take long), I used a square stencil and white paint (the same shade I used on the walls – Valspar’s Pure White) and filled in the centers. I didn’t have a stencil brush, so I used this thick-bristled kid’s one ($1.50 at the craft store) and trimmed all the bristles to the same length. After the paint was completely dry, I applied two coats of Minwax Polycrylic in clear satin to protect it from water. It was just what we had around, and I’ll let you know down the road how everything is holding up. I have already splashed water on it, as well as paint when I was doing some touch-ups, and it wiped right up and looks just fine. We installed the backsplash by screwing strips of wood the same depth as the board into the wall below and above it, and then nailing trim pieces that overlapped the backsplash into those strips. That way we didn’t have to drill directly into it and risk cracking the concrete. Holy cow that faucet is heinous – BUT – after doing all this painting/cementing without having the utility sink operational, I’m grateful for it. In this case, function > form, though I’m hoping to find a sink and faucet that have both. Thanks for reading this post! Please feel free to ask any questions you may have in the comments. Come back on Friday when Mera and I will be doing a round-up of DIYs we’re dying to try and, though we’re taking a break from the Good Score post this week, don’t forget to submit your own Good Scores (either to redhousewest@gmail.com or by using the hashtag #rhwgoodscore) so you’ll be eligible for the giveaway! 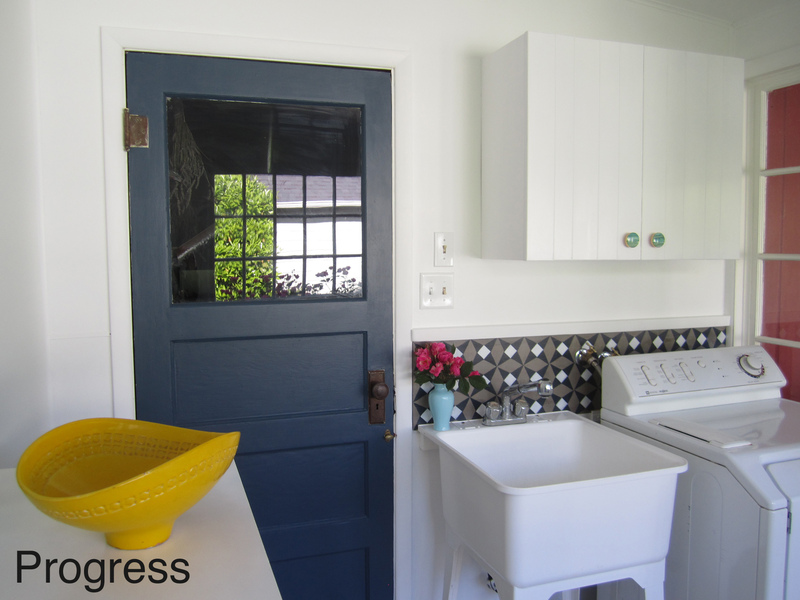 Amazing progress Katiie—I especially like the blue door and your backsplash. I look forward to reading further installments! I’m with Michelle about the blue door. The room looks great! And I love the yellow bowl in there. I’m so impressed with your ability to do these things yourself. I really admire that, and love the humor you use to present it to us. Thanks Carol! 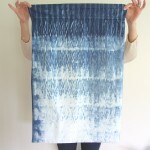 This blog has been a really terrific motivator for taking on these projects. I really appreciate your feedback! Remember gathering around the row of ancient, spring fed, stone tubs in a mountain village in Crete with me and eighteen other women on our Goddess PIlgrimage-tour. I loved thinking of hundreds of years of women’s conversations turing this necessary and onerous task into a community event. We’ve come a long way from rubbing our clothes on stone ridged surfaces but your new laundry invites us to join you there. 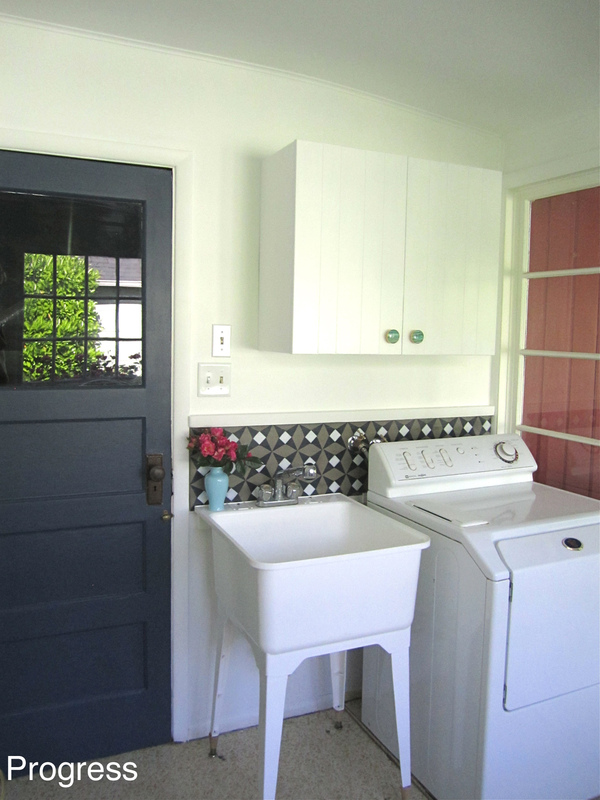 Could you find a vintage stone tub for alongside the washer? 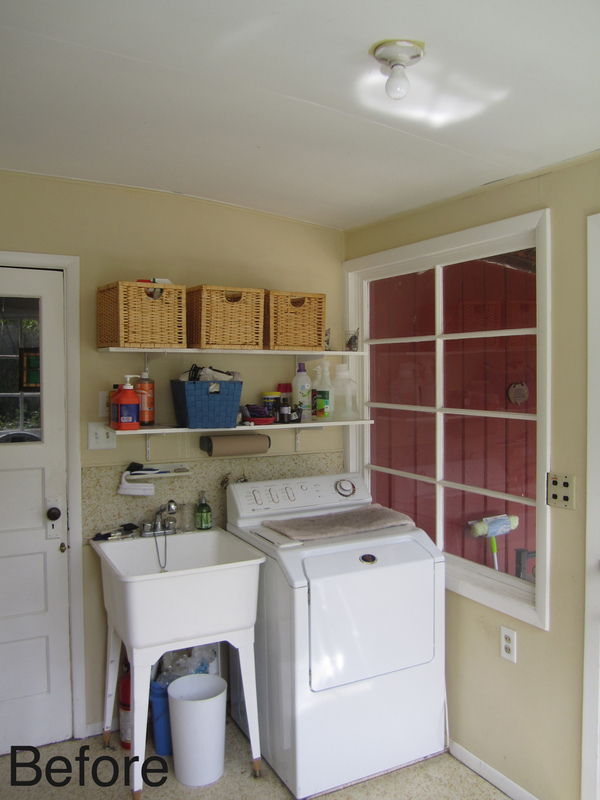 I have to comment on that closed storage – I think I like open storage till I see such a transformed and tranquil site as your well-hardwared cupboard! 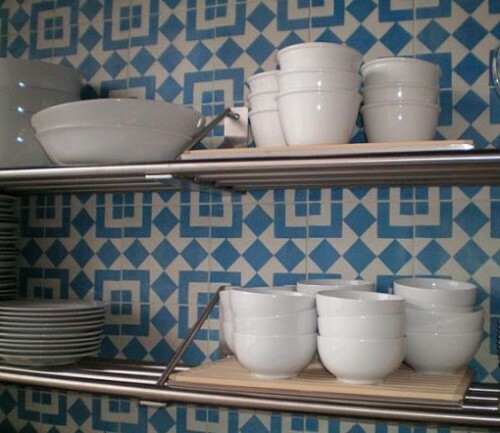 Your backsplash is beautiful – and I think it’s really clever what you do with stencils and patterns – Mera also — you make it look so easy to line things up and keep going without smudges or error messages! I am totally impressed with your forearms. Wow. Sight, not site. 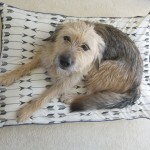 I’ve been too much in the blogosphere! The feeling I get walking into this room is so different now, that blue door makes me happy! 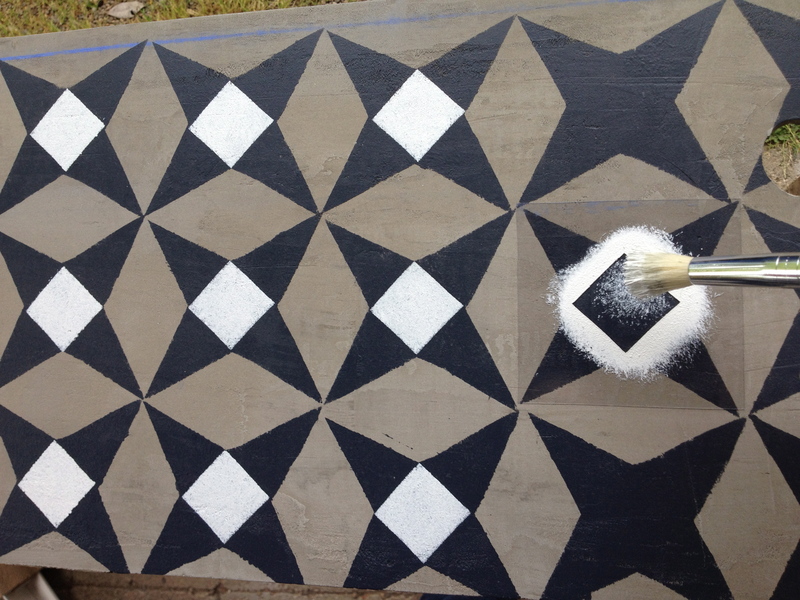 You are so creative-what a great job of stenciling and painting. Wow, great job, i love it! 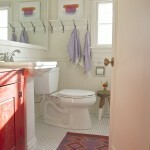 I love Granada tiles too and wanted to use them in the house we are building, but they are out of budget. Thanks for the great idea, I will have to try this in the house or on our patio somewhere!